Raleigh Therapist: Susan Miller - Therapist 27615. Send A Message To Dr. Miller. Session Fees: Call for information about fees. Financial Scholarships available for those who qualify. Susan S. Miller, PhD, LPCS, NCC is a Licensed Professional Counselor Supervisor in North Carolina and a Nationally Certified Counselor. Susan has been a psychotherapist in the Raleigh area since 1981, working in various mental health, educational, social service and medical environments serving hurting people with a compassionate heart. She has been the director of Miller Counseling Services since 2006. Susan has a PhD in Clinical Christian Counseling and Psychotherapy from International University for Graduate Studies in July 2008. She also received a MEd in Counseling from North Carolina State University in 1981, and a BS in Psychology from Southwest Missouri State in 1978. At Miller Counseling Services, Dr. Miller specializes in counseling and coaching individuals with eating disorders and emotional eating, weight/obesity/body image issues, people in life transitions, those seeking career change, women in the many seasons of their lives, parenting teens and young adults. She has clinical expertise in the areas of depression and mood disorders, anxiety disorders such as OCD, social anxiety and panic, as well as grief, loss, trauma, and sexual abuse, gender identity issues, chronic pain/illness and marital/couples therapy. With a 13 year background in educational testing and consulting, specializing in helping families who home school, Susan has developed an expertise in learning disabilities and ADHD. Dr. Miller also provides pre-surgical bariatric psychological evaluations for those seeking bariatric surgery for medical treatment due to obesity. Susan regularly offers group therapy in the areas of eating disorder recovery and emotional eating. Dr. Miller has a warm, compassionate style of individual, family and group counseling, developing a treatment plan that will help bring about solutions, healing and restoration. Susan is a life-time artist with training in painting, multi-media art-making and fiber art. As a part of her work, she offers expressive arts therapy: a blending of art-making, psychotherapy and life coaching creating a unique integrated approach to emotional healing. She uses creative expression to augment psychotherapy and coaching. Along with being a Licensed Professional Counselor at Miller Counseling Services, Dr. Miller is a Certified Creativity Coach and a Right Brain Business Plan® Workshop Facilitator. She offers Life Coaching, Entrepreneur Coaching and Creativity Coaching as well as Creative Immersion workshops, groups and retreats through her creative business Lighted Path® Coaching and Art Studio. Susan and her husband Matt have been married for 35+ years and have raised twins, now adults, a son and daughter. Susan enjoys her pets and wildlife, and being out-of-doors in God’s creation. As a mixed media artist she loves to paint pets, people and wildlife in watercolor & oils, splatter acrylic paints on a canvas to create an intuitive abstract painting, design an art journal or altered book, and sew a quilt or fabric art piece. Her faith in God is the impetus of her mission in the service of healing. Susan Miller, PhD, LPCS, NCC is a Psychotherapist, Certified Creativity Coach and Certified Kaizen-Muse™ Creativity Coach, Entrepreneur Coach, Life Coach & Artist offers coaching & creativity workshops that light the path of your life journey. 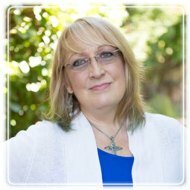 In Susan’s unique coaching and creativity therapy experiences, as well as creativity workshops blending art-making and coaching, you will learn creative strategies to silence your inner critic, listen to your intuition, heal your heart, express your uniqueness, experience more joy and authenticity, and create life vision. Dr. Miller has a warm and engaging style with a compassionate heart. She can help you to focus on the lessons in the moment and to create intentions that will help you to soar above the obstacles and break down walls that get in the way of your dreams. Developing simple small steps that create a balanced approach to living will get you much further than trying to tackle too much at one time; which can leave you feeling overwhelmed, frustrated and out of breath from the climb. With Dr. Miller’s sensible, yet fresh and creative approach to approaching your life dreams, you will see results sooner and experience joy and freedom in the process!